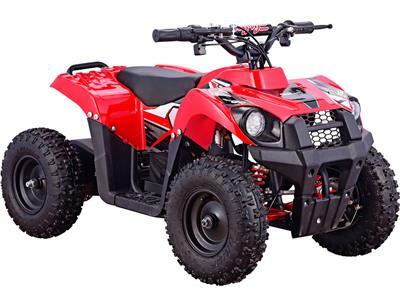 The MotoTec 36v Mini Quad Monster v6 is the ultimate kids atv! Great for driveway and backyard fun, cruise over bumps and speed through dirt trails with ease. Comes standard with front & rear suspension, front & rear brakes and large 13 inch knobby pneumatic tires. This mini quad provides longer ride times than the competition with THREE large 12v 12amp hour batteries. New features include: headlight, key start, battery meter, forward & reverse, 2 speeds selectable by key and twist throttle with safety foot switch.